Official gold purchases reached a new record in 2018 as central banks continued to diversify away from the U.S. Dollar. Not only was 2018 a banner year for central bank gold purchases, but it was also the highest amount for more than five decades. Central banks haven’t bought this much gold in one year since Nixon ended the convertibility of the U.S. Dollar into gold in 1971. According to the World Gold Council 2018 Yearend Gold Demand Trends, Russia funded most of the 274 metric tons (mt) of its official gold purchases with sales of its U.S. Treasury holdings. Furthermore, the next two countries with the largest increase in gold acquisitions in 2018 were Turkey with 51.5 mt and Kazakhstan at 50.6 mt. These three central banks accounted for 58% of the total gold purchases last year. However, the World Gold Council stated in their yearend update that several European central banks were also increasing their gold reserves, such as Hungry and Poland. Since 2010, the first year of official net gold purchases, central banks have acquired a remarkable 4,330 mt of gold (139 million oz). What a difference in central bank gold demand since the 2008 financial crisis. Again, according to the World Gold Council, central banks were net sellers of gold for the previous two decades. (1989-2009). 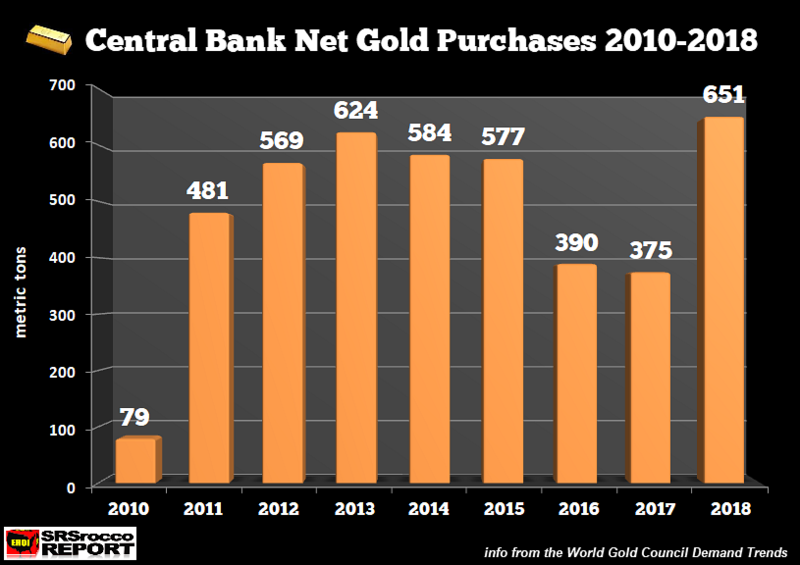 From 1999-2009, central banks sold 4,921 mt (158 million oz) of gold into the market. 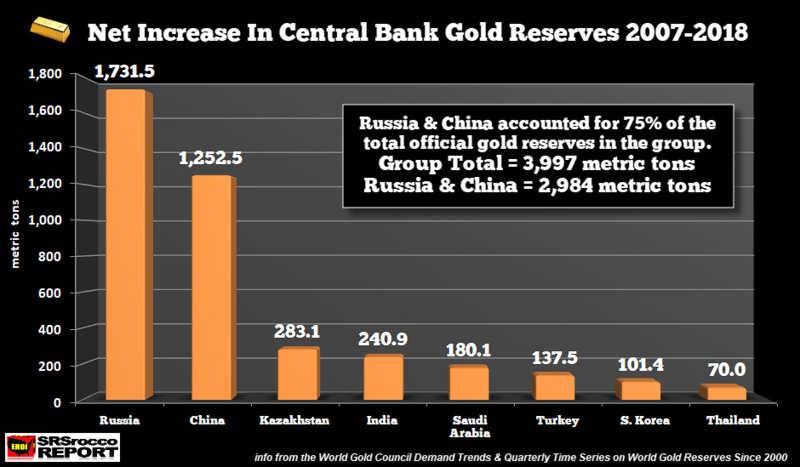 From 2007 to 2018, Russia and China’s official gold purchases of 2,984 mt accounted for 75% of the group’s total (3,997 mt). As we can see, Kazakhstan was the third largest acquirer of gold reserves at 283 mt, followed by India (241 mt), Saudi Arabia (180 mt), Turkey (137 mt), South Korea (101 mt) and Thailand (70 mt). I believe central banks will continue to be net buyers of gold because it is one of the only assets that is not backed by debt. However, that is not the case with most assets like stocks, bonds, and real estate which are backed by hundreds of trillions in debt. A physical gold bar paid in full contains stored economic energy, while the majority of assets are “ENERGY IOU’S.” When the world finally reaches peak oil, you do not want to be holding energy IOU’s.